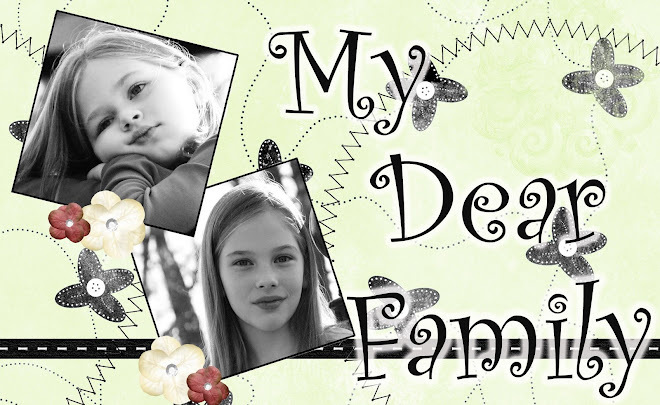 I have to decided to combine our adoption blog with the family blog. You can find the most up to date info on our goings on at http://increasingheartandhome.blogspot.com. Thanks to all my readers!!! I love to listen to Christmas music. There are so many wonderful songs out there, and a few bad ones as well. In my car I normally rotate between talk radio and Christian radio. Although for some reason our local station does to play Christian Christmas music. There is alot of it, and they should give us a break of the same songs they play over and over. This season though, I have gotten some new Christmas CDs - Toby Mac, David Crowder Band, and Matthew West. They are in rotation in my car right now. My favorite is the DCB. It is all your favorite, but with a twist. You will definitely enjoy them all. My girls especially enjoy Toby Mac's. Check them out and enjoy some wonderful Christmas music to enhance your holiday season. Merry Christmas from the Dear Family!!! I have been looking for fun things and games that are easily portable for trips. I saw this game on a friend's blog, and thought it totally fit the bill. She was giving one away, but I was not the winner. I decided to contact the inventor, Rich, and see if I could get one to review on this blog. He graciously sent one for us to try. 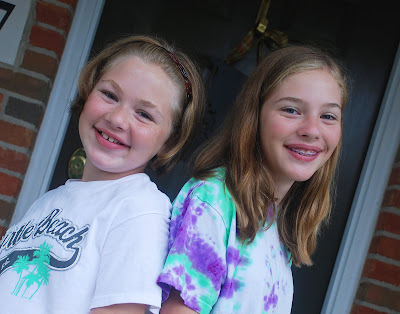 I had not told the girls about it, so pulled it out this morning to have a fun thing to start our school day. I had them draw the cards before I gave them instructions on what to do. They started and loved it. They ended up doing it several more times, and can't wait to show it to their friends and family. Without my prompting said that we would definitely have to take it to China. Pick and Draw is great for any age, and it comes highly recommended by a 10 and 12 year old. This would be a great stocking stuffer. This game is only available on their website, and they are running a special for November and December. Buy one game and get the second one $2 off. Tomlin song at some point. He has written some of our greatest modern worship songs. work is called "How Great is Our God:The Essential Collection". I have CD right now in my car is it just great to have to have and just worship the Lord. having all these great worship songs in one place. It is that time of year when school supplies are flying off the shelves. Parents frantically getting their children scheduled into anything and everything. Myself as a piano teacher, trying to schedule around their schedules. So here we are entering our 8th year of homeschooling, and I am surprised any of has still has hair, except maybe my hubby. We have scaled down some extra-curricular, and started some new things. Due to our travel to China in a few months, we are trying to get a big part of school done this semester. We are trying to learn Mandarin. As a family, we are playing tennis. Hannah is actually on her first tennis team this fall. She is playing on the Granville jr. high girls club team. One thing that will definitely be different, the girls have retired their dancing shoes. This will be a shock to some, but we felt as a family it was time to move on. We are looking forward to more family time and preparing for our new little girl. Here is our first day of school picture. Being a homeschool family, there are no backpacks, no dress code, no bus or carpool lane, and no new clothes. It is just us with our books, positive attitudes, and come as you are to school. Where are those little girls that were just starting school? When we moved to Ohio 6 years ago, that tall one was just entering 1st grade. What is robbing your JOY? Joy and happiness are two highly sought after things in this world. Can you have one without the other? YES. To me, being happy can come and go, but joy is a deep down heart issue that can only be found in God. While you may not be happy or have happiness about what is going on around you, you can have joy - PRAISE THE LORD! For the past couple of weeks I have been meditating and praying through Psalm 119. It is the longest chapter in the Bible, but oh the nuggets and jewels found in this passage. My hubby mentioned in one of his sermons that William Wilberforce memorized this entire chapter and would recite it everyday. While I am not sure I could memorize all of it, but I cannot start my day without it. I have chosen not to let people and circumstance steal my joy. If you need encouragement - READ THIS CHAPTER!! Ps 119:1-2 Joyful are people of integrity,who follow the instructions of the Lord. Joyful are those who obey his laws and search for him with all their hearts. Ps 119:35 - Make me walk along the path of your commands, for that is where my happiness is found. Ps 119:37 - Turn my eyes from worthless things, and give me life through your word. Ps 119: 58 - With all my heart I want your blessings. Be merciful as you promised. Ps 119:92 - If your instructions hadn't sustained me with joy, I would have died in my misery. These are just a few that speak volumes. Pray through these verses. I go back to them everyday and re-read many sections. You may ask, I cannot read all those at one time. God has nicely divided them into different sections. Take one a day, or even take one section a week and pray God's Word. It can bring the JOY you are searching for. A popular art item currently is what is called SubwayArt. 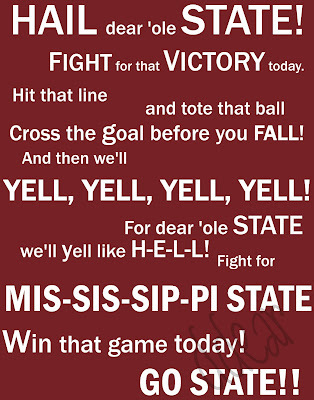 I recently who someone had taken the Auburn fight song and turned it into art. Most people us their Cricuts to make them, but since I do not own one - I took to my handy-dandy computer and used photoshop. 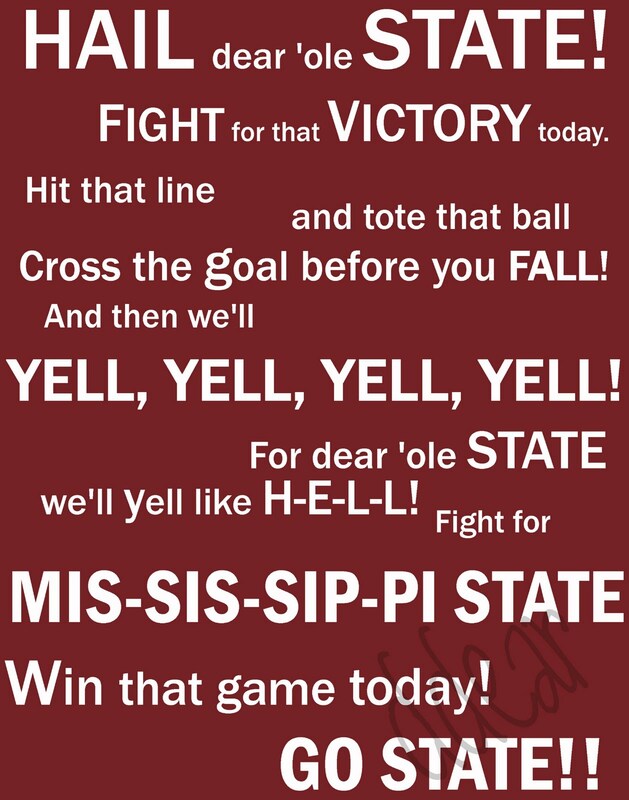 Here is my result for the MSU fight song. Coming soon to an etsy sight near you...maybe? I think it would look good either as a poster or printed on canvas.